I passed by a Jollibee store this afternoon and I couldn't help but notice something new on the menu: The Chicken and Mushroom Pasta. 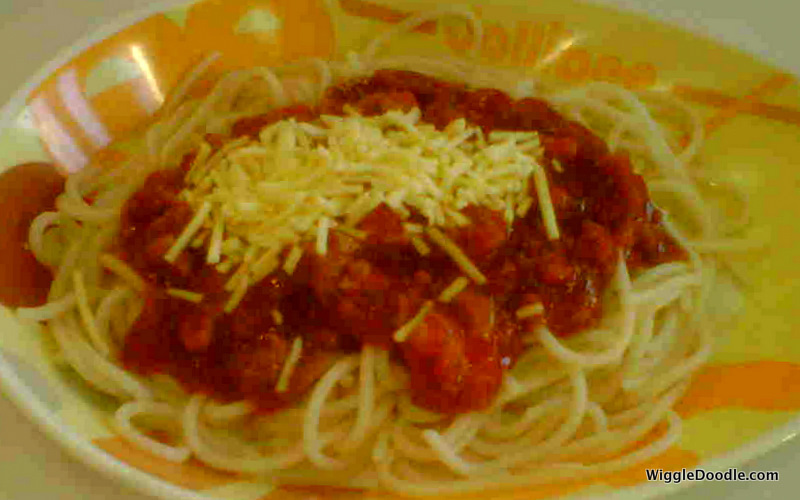 It has chicken, mushroom and a spicy sauce topped with cheese in a platter of spaghetti. Sounds yummy? No. One spoonful of this new dish and I immediately noticed a peculiar taste. Maybe it's the herbs and spices in the sauce but it didn't taste natural. It tasted more like chicken cube or bouillon. In fact my initial reaction was, "Hello Maggi or is that you Knorr?" Maybe it would taste better if they put a slice of bread or a bread stick to go with it. Just to neutralize the saltiness and spice of the dish. What saved the afternoon from becoming a total disaster was the appearance of the Jollibee mascot who greeted the people in the store and even entertained us with a dance number.